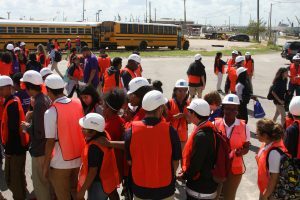 Houston area attended Manufacturing Day at Storage and Processors on October 5, 2017. 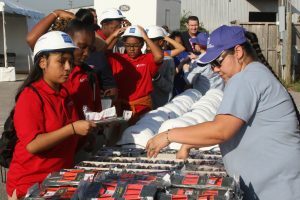 As part of their day, they toured the Storage and Processors facility, learned more about steel testing with our partner SPS Metallurgical Labs, had a Maritime educational workshop aboard a Port of Houston tour boat, and had a tasty lunch grilled by the Storage and Processors staff. As with everything at Storage and Processors, it starts and ends with Safety, so the first stop was to get all of the PPE that they would wear all day. 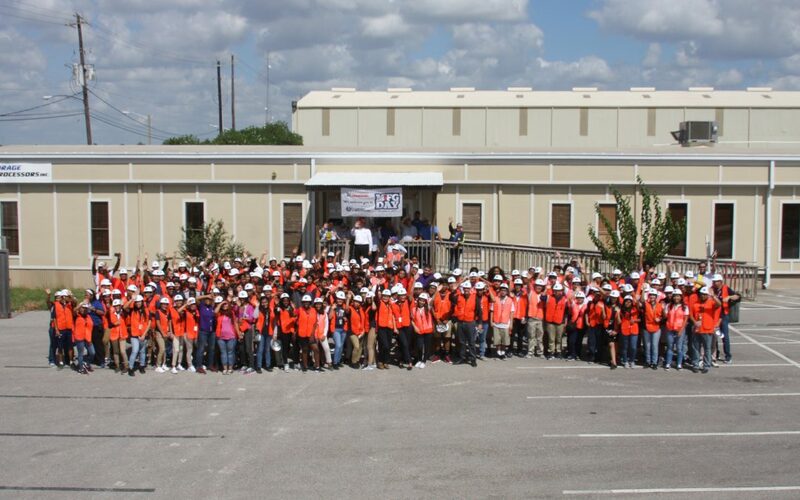 Hard hats, safety vests, safety glasses and ear protection were provided for all participants. 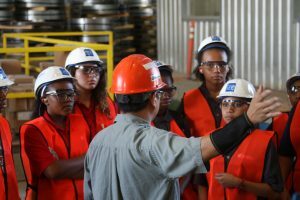 The Storage and Processors staff walked the future manufacturers through what we do as well as how and why we do it. 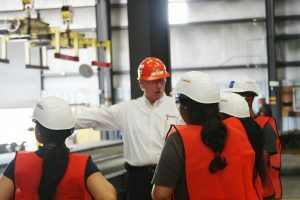 From how the steel comes to us, to the various ways we unload, store, tension-level, slit, cut-to-length and ship tens of thousands of tons per year, the Storage and Processor’s staff enjoyed sharing how manufacturing is not only interesting; it is a viable, good paying career. SPS Metallurgical Labs also got into the spirit by welcoming the future manufacturers into the testing lab and explaining why steel gets tested and how the process works. 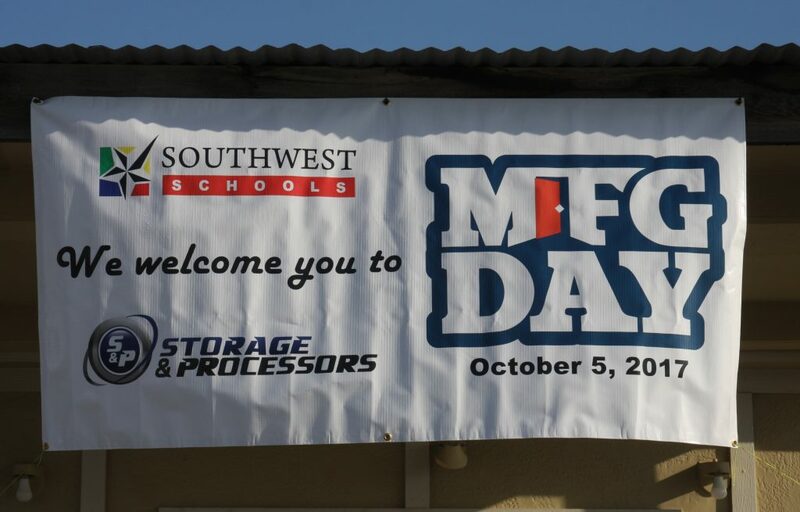 All in all, another great Manufacturing Day at Storage and Processors. We hope that all enjoyed the day, the burgers and the in-depth look at Storage and Processors and careers in manufacturing. If we inspired even one person to take a serious look at a manufacturing career it was all worth it. Thanks to all of the teachers, administrators, students and Storage and Processors staff who worked hard to make Manufacturing Day great. “I am President of the Board of Directors of Southwest Schools, a Charter School here in Houston. The phenomenal Manufacturing Day events that we have held over the past three years have been the catalyst to drive the school to expand the STEM and STEAM programs at the Grade Schools and High School. To that end, when the Middle – High School was expanded this year, we opened up an Industrial Arts Building and with a generous cash donation from Chevron and others we now have equipped our facility and have in place a Robotics Lab, CNC Machines, and a 3-D Printer. STEM programs are offered and I am pleased to announce that our High School Girls have started their own club called the “STEMINISTS” and are learning to code and build their own Robots. Manufacturing Day at Storage and Processors has broadened the horizons of many of the Students, Staff, and Administrators and now they realize that there are great careers available in Manufacturing. My Passion – I look forward to one day in the near future that we have a former student of Southwest Schools that went on to obtain their degree with a STEM or STEAM curriculum, applying for work at Steel and Pipe or Storage and Processors. -Rick Hargrove, Director/General Manager, Storage & Processors Inc.